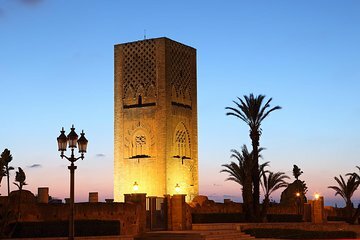 Check off the Moroccan capital’s landmarks on a private day-trip to Rabat from Marrakech. Travel north to the Atlantic coast city and take a guided tour of its historical and cultural highlights while learning about its past and culture. See the 12th-century Hassan Tower and marble Mausoleum of Mohammed V, visit the UNESCO-listed Roman and medieval ruins of the Chellah, and explore the blue-and-white 'kasbah' (fortress) and shops of the 'medina' (old quarter). Depart your Marrakech accommodation by private, air-conditioned vehicle and travel northward to Rabat, Morocco’s capital. Fringing the Atlantic Coast and River Bouregrag, this charming city mixes smart modern areas with sandy beaches, Roman ruins, and medieval Islamic and French colonial-era buildings. On arrival, enjoy a tour of the highlights. Admire the intricately carved Hassan Tower, the last remnant of what was a 12th-century mosque; and view the magnificent marble Mausoleum of Mohammed V and his son, Hassan II. View the Al Moouahidin Gate and tour the 12th-century Kasbah Oudaya, Rabat’s old citadel. Set on the site of a clifftop fortress-monastery, this quarter of pretty blue-and-white houses was a pirates’ gathering-place and departure point for armies leaving to conquer Spain in the 1700s. Next, explore the UNESCO-listed Chellah, the walled ruins of a Roman town and medieval Muslim necropolis. See the crumbled columns, walls, and temples as your guide shares their history, and afterward, if you wish, see the art displayed at the Museum Mohammad VI of Modern and Contemporary Art. Finally, stroll and shop around the carpet, jewelry, and trinket shops of the walled medina before finishing your tour with a drop-off at your Marrakech accommodation.